I'd like to thank everyone for reading my small tribute to Ivy last week. She was a special dog and simply knowing that people were reading about her made me feel a bit better. These cookies are inspired by Ivy and will give me another chance to regale you with a few more stories. Ivy was a dog that loved to eat, and my mother loved to feed her :). We used to joke in high school that Ivy was fed better then some of my friends (true story). Though, by far her two favourite meals were soup stock chicken and pasta. The sounds Ivy made when eating either meal was reminiscent of the scene in Jurassic Park where they lower the cow into the raptor pen. Although as much as she loved food, Ivy could be incredibly picky with what she ate. During a trip to Waterloo (Ontario) to visit the University campus (wow! 12 years ago); my parents, brothers, Ivy and I stopped off at McDonalds for lunch. Say what you will about McDonalds, but there are times when only a McDonalds burger will do. Not sure what to get for Ivy, my mother bought her a cheeseburger, thinking she would give her the patty. That afternoon we happily sat in our minivan stuffing our faces. Eventually my mother offered Ivy her burger with a "Wanna try some Ivy-girl?" Ivy looked at my mom, looked at the patty, gave it a sniff, and looked up again as if to say: "The hell is this?" Ivy also disliked working for her food. On one occasion my uncle, who thinks of himself as somewhat of a "dog whisperer," decided that he was going to show Ivy who's boss and teach her a new trick. He proceeded to lure her with a treat, walking her in and out between his legs in a figure eight pattern. To his credit, it worked, for the first twenty seconds. Ivy quickly realized that she wasn't actually going to recieve the treat, sat down, looked up, and waited. Being picky, Ivy typically only liked treats that were soft and/or chewy. The exceptions to this were if it was a peanut or happened to be flavoured with honey. Tempt her with a honey flavoured treat and your fingers were likely at risk. Every Sunday morning I brought her one Honey Glazed Timbit from Tim Hortons and never was she more excited to see me. When she heard me pull into the driveway, she knew, and she came running. True, she was excited to see me regardless of the day, but on Sunday mornings it was different. And I would so torment her by not giving her the entire Timbit at once. Instead she got it to piece by piece. The look in her eyes as she ate it was priceless. I only ever made her homemade treats once, and it was a few weeks ago. I wish now I had done it more often. She absolutely loved them, and of course, were sweetened with honey. After she passed away last week, I decided that I wanted to bake a cookie that she would go crazy for. 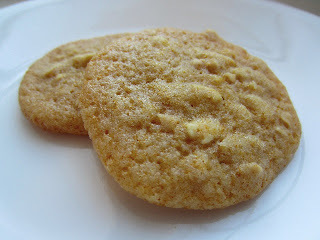 I found a recipe via Cookie Madness for a Chocolate Chip Maple Honey cookie. I halved the recipe, and tossed out the maple, replacing it with honey, and then added a little more. It might be the first time that I have ever added more sugar to anything. But these were for Ivy. I also removed the chocolate chips, partially in keeping with the spirit of the cookie (chocolate is bad for dogs), and also because I wanted the focus to be on the honey. To help balance the flavour I used peanuts, as these would be the only "nut" Ivy would have wanted. 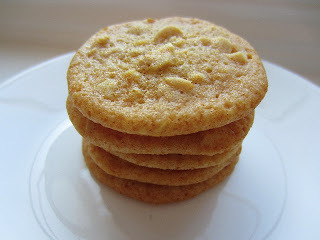 These cookies are also the first recipe I have ever made using shortening, and it definitely won't be the last. The very fact that I can store it outside of the refrigerator will ensure that :). This cookie dough is a little unusual because it is quite loose, almost bordering on a batter. But worry not, it bakes up perfectly even without refrigerating. On day one the cookies are thin, crispy at the edges, and soft and chewy throughout. If you can imagine a Chewy Chips Ahoy! cookie, it's kin to that but chewier. On day two, depending on how you store them, they lose their crispiness (and become a bit stickier), but retain their amazing chewy texture. These are definitely the sweetest cookies I have ever made, but not sweet enough to make you cringe. Besides it's not just a sugary sweet, it has the rich notes of honey. The peanuts offer a fantastic contrast to the texture and also help mellow out the sweetness. And to top it off, each bite will entice your palate with a little hint of salt. It was so good that next time I might add a touch more salt to the dough or use salted peanuts. Despite my minor changes, I knew this recipe would be terrific. How? Well, I'm a person that likes to attach sentimentality to almost everything, and when my first test cookie came out of the oven it looked, to me, to be in the shape of a heart. Though even with my supernatural instincts, I was blown away with how good these cookies were. I truly have nothing bad to say about them. 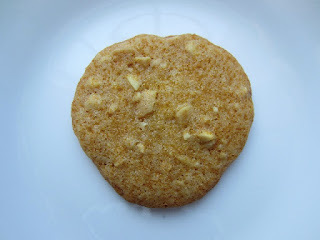 This thin, chewy honey peanut cookie is sensational. I'm sure Ivy would have loved them. Kinda looks like a heart, right? Preheat oven to 350F and line cookie sheets with parchment paper. In a small bowl add flour, baking soda, and salt and whisk to combine. Add shortening into the bowl of a mixer and beat until light and fluffy. Add honey and a 1/3 of a cup at a time, beating until combined. Add eggs and continue to beat until completely combined (it will look like cottage cheese). Beat in vanilla until combined. Reduce mixer speed to low, and slowly add dry ingredients until just combined. Drop by rounded teaspoonfuls onto prepared cookie sheets and bake for 10 to 11 minutes (10.5 for me) or until cookies are golden brown. Allow to cool on cookie sheet for two minutes before moving to rack to cool completely. Becareful as the cookies will be very soft. I teared up again at the heart-shaped photo! What a beautiful post! It is so funny how dogs can have very distinct preferences about food and 'teach' us which foods they like. I love your oh-so-Canadian ritual with the Timbit! My dog's favorite food is roast chicken. I don't have a particular time and ritual about making chicken, but once the house is filled with the aroma, my dog works herself into a state of frenzied anticipation. She also always know when I take the chicken out of the refrigerator to reheat it, versus vegetables or other food that doesn't excite her very much. Her other favorite food is french fries, which I don't eat, but which I've allowed the children of friends to feed her. Once when I did get her some, for weeks afterward she would look hopeful whenever I rustled a paper bag by accident. The cookies look wonderful--like Ivy, I have some friends who adore honey, and it can be hard to find a cookie where the flavor really shines, and it's not just used as an accent. Good it does kind of look like a heart, I'm not crazy :). Though most won't classify Tim Horton's Doughnuts as doughnuts I quite enjoy them, and it pained me to say it late last year, but McDonald's Coffee is better, if not more inconsistent. Granted, I still have soft spot for Tim Horton's and thankfully we never got Ivy hooked on Coffee :). Yeah Ivy was the same, as soon as she smelled that my mother was making soup, she was constantly underfoot waiting to be fed.... and as soon as she was, the noises began, and then finished disturbingly quickly :). She liked french fries too, basically if we were eating it, she wanted it.. I would definitely try these cookies out on your friends. I agree that it's really difficult to find anything where the honey is not a foil for some other flavour. And depending on the honey you use, I'm sure you can get a variety of subtle differences. My mouth is watering-I *love* honey! A honey nut cookie. Yum!! Never heard of a dog that liked honey that much, but I had a parakeet who ate bologna and my cat likes cantaloupe juice so anything is possible!